Graft-versus-host disease (GVHD) is one of the major obstacles for the success of allogeneic hematopoietic stem cell transplantation. In this article, we report that the interaction between OX40L and OX40 is of critical importance for both induction and progression of acute GVHD (aGVHD) driven by human T cells. Anti-human OX40L mAb (hOX40L) treatment could thus effectively reduce the disease severity in a xenogeneic-aGVHD model in both preventative and therapeutic modes. Mechanistically, blocking OX40L–OX40 interaction with an anti-hOX40L reduces infiltration of human T cells in target organs, including liver, gut, lung, and skin. It also decreases IL-21– and TNF-producing T cell responses while promoting regulatory T cell responses without compromising the cytolytic activity of CD8+ T cells. Single blockade of hOX40L was thus more effective than dual blockade of IL-21 and TNF in reducing the severity of aGVHD as well as mortality. Data from this study indicate that OX40L–OX40 interactions play a central role in the pathogenesis of aGVHD induced by human T cells. Therapeutic strategies that can efficiently interrupt OX40L–OX40 interaction in patients might have potential to provide patients with an improved clinical benefit. Allogeneic hematopoietic stem cell transplantation (HSCT) offers great opportunities for curing hematologic malignancies. However, graft-versus-host disease (GVHD) is one of the major causes of HSCT failure. Current posttransplant prophylaxis is primarily based on the use of nonspecific immunosuppressive drugs, which include corticosteroids, calcineurin inhibitors, methotrexate, mycophenolate mofetil, and sirolimus (1–4). Such nonspecific immunosuppression neither spares pre-existing memory cells nor discriminates between alloreactive and nonalloreactive T cells. Thus, controlling GVHD with nonspecific immunosuppressive drugs comes at the cost of increased graft failure, disease relapse, drug toxicity, and compromised immunity to posttransplant infections, such as CMV (5). Even though glucocorticoid treatment is a first-line therapy, a substantial number of patients are not responsive to it (6), and the management of steroid-refractory acute GVHD (aGVHD), which is associated with poor prognosis, often requires custom-tailored therapy because of the lack of standardized preventive measures. Therefore, it is important to develop a new strategy that can prevent and treat aGVHD while preserving host immunity to infections and graft-versus-leukemia effect. Dendritic cells (DCs) play an important role in the development of aGVHD after transplantation (7–9). Accordingly, depletion of DCs or blockades of certain costimulatory molecules result in improved allograft survivals with a reduced incidence of GVHD (7, 8, 10). Among the costimulatory molecules, OX40L is known to contribute to T cell–driven inflammatory diseases, including asthma, experimental autoimmune encephalomyelitis, collagen-induced arthritis, and fibrosis (11–15). Previous studies have also shown that blocking OX40L early in the post–bone marrow transplantation (BMT) period reduces the severity of aGVHD manifestations in murine mammals and nonhuman primates (16–18). Such preventative effect of OX40L blockade is independent of STAT-4 for T helper 1 (Th1) or STAT-6 for Th2 signaling (17). In addition, another study also reported that anti-mouse OX40L Ab treatment reduces aGVHD manifestations in BMT, but with an increase of Th2 responses (19). In contrast to the data generated in animals (16, 19), OX40L expressed on human DCs is well known to play a key role in the induction and promotion of inflammatory Th2 responses with an increase of STAT-6 activation (20–22). Recently, we and others have also demonstrated a pivotal role of OX40L in promoting T follicular helper (Tfh) cell responses (23, 24). It is thus important to test whether OX40L–OX40 interaction is also a critical component for the induction and progression of aGVHD induced by human APCs and T cells. Furthermore, understanding the mechanisms by which OX40L blockade alleviates aGVHD manifestations induced by human immune cells will also be fundamental for the clinical development of OX40L blockade in future. In this study, we thus investigated whether OX40L–OX40 interaction is a critical component for the induction as well as for the progression of ongoing aGVHD. This was tested by measuring preclinical efficacy of an anti-human OX40L mAb (hOX40L) in immunodeficient mice transplanted with human PBMCs. We also assessed the mechanisms by which anti-hOX40L suppresses aGVHD. Female NOG (NOD.Cg-Prkdcscid Il2rgtm1Sug/JicTac) mice (Taconic Biosciences) were housed in a specific pathogen-free environment at the animal facility. All experiments were performed under the protocol approved by the Mayo Clinic and Baylor Health Care System Institutional Animal Care and Use Committee. All mice received daily monitoring and care from the animal facility staff under the supervision of a veterinarian. On day 0, female NOG mice (6–8 wk old) received 1 × 107 freshly isolated human PBMCs via tail vein. PBMCs were isolated from buffy coats (Carter BloodCare) by density-gradient centrifugation using Ficoll-Paque Plus (GE Healthcare). In a preventive mode, animals were given anti-hOX40L or IgG2b (10 μg per dose) i.p. three times weekly from day 1 posttransplantation through week 3. In a therapeutic mode, animals were given anti-hOX40L or IgG2b (10 μg per dose) i.p. three times weekly from day 21 posttransplantation through week 6. Clinical symptoms of aGVHD were graded according to published criteria (25). Peripheral blood was collected weekly after transplantation. aGVHD mice were euthanized in week 2 or week 4 posttransplantation. Liver, lung, spleen, skin, and gut tissues were collected for flow cytometry and histological analysis. Mouse mAb specific for human OX40L (19A3, IgG2b, GenBank accession number: MF589177 [www.ncbi.nlm.nih.gov/nuccore/MF589177.1] and MF589178 [www.ncbi.nlm.nih.gov/nuccore/MF589178.1]) was generated in-house as described previously (26). Recombinant fusion protein of hOX40L ectodomain and hIgG Fc (26) were expressed using the UCOE pCET-HS-puro vector system according to the manufacturer’s protocol (Life Technologies), and purified by HiTrap protein A affinity chromatography (GE Healthcare). Anti-hOX40L (19A3, IgG2b) was purified by HPLC using MabSelect SuRe HiTrap affinity column (GE Healthcare). The specificity of anti-hOX40L mAb was characterized by staining L cells transfected with hOX40L and by ELISAs using plates coated with recombinant hOX40L ectodomain fused to hIgG Fc generated as previously described (26). Blood myeloid DCs (mDCs) (Lin–HLA-DR+CD11c+CD123–) and allogeneic naive CD4+ T cells (CD45RA+CD45RO–CCR7+) were sorted by FACSAria II (BD Biosciences). The purities of FACS-sorted cells were >99%. Total T cells, CD4+ cells, and CD8+ T cells were isolated from PBMCs using enrichment kits (STEMCELL Technologies). Cells were cultured in a complete RPMI (cRPMI) 1640 medium containing 10% FCS (Gemini). cRPMI 1640 is composed of RPMI 1640 (Thermo Fisher Scientific) supplemented with 50 U/ml penicillin, 50 μg/ml streptomycin, 2 mM l-glutamate, 1× nonessential amino acids, 1 mM sodium pyruvate (Sigma-Aldrich), and 25 mM HEPES (Thermo Fisher Scientific). mDCs were stimulated for 24 h with 20 ng/ml thymic stromal lymphopoietin (TSLP) (27) and then washed. A total of 2 × 104/ml TSLP-mDCs were cocultured for 7 d with 2 × 105/ml allogeneic T cells in the presence of anti-hOX40L or control Ab (5 μg/ml). T cells were then restimulated with Dynabeads human T-Activator CD3/CD28 (Thermo Fisher Scientific) for 24 h. T cell cytokine expression was assessed by intracellular cytokine staining as well as by multiplex bead-based assay (MilliporeSigma). Tissue samples were homogenized and filtered through a 70-μm strainer. Human mononuclear cells (MNCs) were isolated by density-gradient centrifugation with Percoll (GE Healthcare). Cells were washed with cRPMI prior to analysis. Spleen cells were further treated with RBC lysis buffer (Tonbo Biosciences). To assess intracellular cytokine expression by T cells, cells were stimulated for 6 h with phorbol 12-myristate 13-acetate (Sigma-Aldrich) at 25 μg/ml and ionomycin (Sigma-Aldrich) at 1 μg/ml in the presence of brefeldin A and monensin (BD Biosciences). Abs specific for CD3 (OKT3), CD8α (RPA-T8), CD123 (6H6), CD127 (A019D5), CD278 (ICOS, C398.4A), IL-21 (3A3-N2), TNF (MAb11), IL-4 (MP-425D2), IL-5 (JES1-39D10), IL-13 (JES10-5A2), HLA-DR (L243), CCR4 (L291H4), and linage mixture were purchased from BioLegend. Abs specific for CD4 (RPA-T4), CD11c (B-ly6), CD19 (HIB19), CD25 (2A3), CD45 (HI30), CD56 (NCAM16.2), CD279 (PD-1, EH12.1), IL-17 (N49-653), and IFN-γ (4S.B3) were from BD Biosciences. Abs specific for CD14 (61D3), IL-10 (JES3-9D7), CTLA-4 (14D3), and Foxp3 (PCH101) were from eBioscience. Anti-CXCR5 (51505) was from R&D Systems. Live/Dead Fixable dead cell stain kit and CellTrace CFSE Cell Proliferation kit were purchased from Invitrogen. Neutralizing anti-human IL-21 mAb (hIL-21) was generated as previously described (28). Etanercept was purchased from the pharmacy at Baylor University Medical Center. LSRFortessa (BD Biosciences) was used, and flow cytometry data were analyzed with FlowJo v9 (FlowJo LLC). NOG mice with GVHD were i.p. injected with 1 × 107 γ-irradiated (30 Gy) U937 cells (American Type Culture Collection) on days 0, 7, and 14. GVHD mice were treated with anti-hOX40L or IgG2b at 10 μg per dose on days 1, 3, 5, 8, 10, and 12 and were euthanized on day 21. NOG mice with GVHD without i.p. injection of γ-irradiated U937 cells served as unimmunized control group. Human CD8+ T cells were enriched from spleens using enrichment kits (STEMCELL Technologies). The purity of enriched CD8+ T cells was >92%. CD8+ T cells were cocultured with calcein-acetoxymethyl (calcein AM)–stained U937 cells at varying E:T ratios for 4 h at 37°C. The fluorescence release into the supernatant by the lysed target cells was measured on a SpectraMax M2 (Molecular Devices). Percentage of lysis was calculated based on the background-subtracted test fluorescence relative to the maximum fluorescence without background. Background fluorescence was defined as spontaneous calcein AM release by the labeled U937 without any CTLs. Maximum fluorescence was defined as calcein AM release in the presence of 4% Triton-X 100 (Sigma-Aldrich) (29). Significance was determined in Prism 6.0h (GraphPad Software) using the ANOVA test for multiple comparison tests or Student t test for two-group comparisons. Survival rates were analyzed by log-rank test using the Mantel–Cox method. The p values <0.05 were considered statistically significant. A mouse anti-hOX40L mAb (clone 19A3, IgG2b) was generated, and its specificity was verified by staining hOX40L-expressing L cells (Fig. 1A) and ELISAs (Fig. 1B). We next tested whether anti-hOX40L (19A3) is capable of modulating allogeneic CD4+ T cell responses elicited with TSLP-treated mDCs. Fig. 1C shows that anti-hOX40L treatment resulted in decreased IL-5–, TNF-, IL-21–, and IFN-γ–producing CD4+ T cell responses, whereas it promotes IL-10–producing CD4+ T cell responses. In support of the increase of IL-10–producing CD4+ T cell responses, anti-hOX40L treatment increased the frequency of CD25+Foxp3+CD127low regulatory T cells (Tregs) (Fig. 1D). To test whether anti-hOX40L mAb could prevent the development of aGVHD, we employed a xenogeneic-aGVHD (x-aGVHD) model, in which human T cells play a central role in the pathogenesis of aGVHD (30). GVHD development in this model is dependent upon human PBMC xeno-reactivity with mouse major histocompatibility class I and class II (31–33). Following an i.v. injection of human PBMCs on day 0, animals received i.p. injections of either control IgG2b or anti-hOX40L mAb at indicated time points (Fig. 2A). The amount of Ab used in this study was predetermined (Supplemental Fig. 1A). Anti-hOX40L treatment enhanced mouse survival at both 10 and 100 μg per dose. However, the frequency of human cells was significantly decreased at 100 μg per dose (Supplemental Fig. 1B). A dose of 10 μg was thus chosen for this study. Fig. 2A shows that mice treated with anti-hOX40L maintained and even gained body weight throughout the course of the experiment, whereas mice treated with IgG2b lost almost 20% of body weight by week 4. In addition, anti-hOX40L–treated mice exhibited a significantly increased overall survival rate (Fig. 2B). All mice treated with IgG2b developed aGVHD from week 2, but anti-hOX40L–treated mice were symptom free until week 8, 5 wk after the last dose of anti-hOX40L (Fig. 2C). Weekly analysis of circulating human leukocytes in the peripheral blood showed that human CD45+ leukocytes were detected in all mice, and their frequency peaked in week 4 for IgG2b-treated mice and week 8 for anti-hOX40L–treated mice (Fig. 2D). Fig. 2E shows that the kinetics of the frequency of CD3+ cells closely resembled that of CD45+ cells. Accordingly, the majority (>70%) of the human CD45+ cells in the blood of aGVHD mice were CD3+ (Fig. 2F), as previously reported (34, 35). The frequency of circulating human CD4+ T cells remained comparable in the two groups for the first 2 wk posttransplantation. At week 3, circulating human CD4+ T cell level was decreased in mice receiving IgG2b as compared to mice receiving anti-hOX40L (Supplemental Fig. 2A). In contrast, circulating human CD8+ T cell level was increased in IgG2b-treated mice compared to anti-hOX40L–treated mice (Supplemental Fig. 2B). The percentages of human CD19+ B cells, CD14+ monocytes, and CD3–CD56+ NK cells all decreased over time in the two groups (Supplemental Fig. 2C–E). Taken together, these results show that anti-hOX40L treatment can effectively prevent the development of aGVHD in the x-aGVHD model. Mice treated with anti-hOX40L had decreased engraftment of human T cells at an early time point, but it expanded over time without showing aGVHD symptoms. 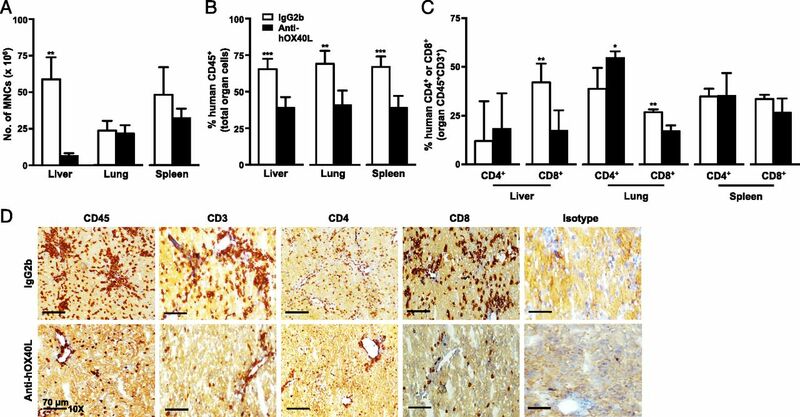 Tissue damage in target organs caused by human lymphocytes in aGVHD models is mainly due to an infiltration of human lymphocytes and cytokine storm (36, 37). We therefore analyzed human leukocyte infiltration in the liver, lung, and spleen of recipient mice on week 4 before control mice died. As shown in Fig. 3A, the absolute numbers of MNCs isolated from the livers of anti-hOX40L–treated mice were significantly lower than those from the IgG2b-treated mice. However, this was not the case in the lungs or spleens. Further analysis of single-cell suspensions of the target tissues shows that anti-hOX40L–treated mice had a significantly lower infiltration rate of human CD45+ cells in the livers, lungs, and spleens than IgG2b-treated mice (Fig. 3B). Anti-hOX40L treatment did not significantly alter human CD4+ T cell infiltration in the livers, but it decreased CD8+ T cell infiltration (Fig. 3C). Immunohistochemistry data (Fig. 3D) further demonstrated that anti-hOX40L treatment could decrease CD8+ T cell infiltration in the livers. Livers of the IgG2b-treated animals were heavily infiltrated by human CD45+ cells, including CD3+ T cells, whereas anti-hOX40L treatment decreased the infiltration of these cells. Anti-hOX40L treatment also resulted in decreased infiltration of CD45+, CD3+, CD4+, and CD8+ cells in both guts and skin (Supplemental Fig. 3). Taken together, these data (Fig. 3, Supplemental Fig. 3) suggest that anti-hOX40L treatment reduces human T cell infiltration in the aGVHD target organs. To further understand the mechanisms whereby anti-hOX40L treatment alleviates x-aGVHD, we first investigated OX40L expression by DCs and T cells. As shown in Fig. 4A, during x-aGVHD, OX40L-expressing CD1c+ cells closely interacted with T cells in the spleens. Interestingly, the majority of T cells in the spleens also expressed OX40L, as previously described (38). We next investigated the cytokine expression profiles of splenic T cells from the two groups of mice on week 4. As shown in Fig. 4B, anti-hOX40L treatment resulted in the enhancement of IL-10–producing CD4+ T cell responses, whereas it decreased IL-21–, TNF-, and IFN-γ–producing CD4+ T cell responses. Such decreases were similarly observed in CD8+ T cell responses (Fig. 4C). In line with the increase of IL-10+ CD4+ T cell responses (Fig. 4B), anti-hOX40L treatment also increased the frequency of CD25+Foxp3+CD127loCTLA-4+CCR4+ Tregs (Fig. 4D) (39). Anti-hOX40L treatment also resulted in decreased expression of PD-1 on the surface of CXCR5+ICOS+CD4+ Tfh cells (Fig. 4E). We also investigated the cytokine expression profiles of T cells from both livers and lungs from the two groups of animals (Supplemental Fig. 4). Anti-hOX40L–treated mice had less abundant IL-21+ and IFN-γ+CD4+ T cells (Supplemental Fig. 4A) in the livers as well as in the lungs (Supplemental Fig. 4B). Anti-hOX40L treatment also resulted in decreased frequency of IL-21+, TNF+, and IFN-γ+ CD8+ T cells in the livers (Supplemental Fig. 4C) and lungs (Supplemental Fig. 4D). Although the differences were not statistically significant, there was a tendency toward increased IL-10+CD4+ T cells in both livers and lungs (Supplemental Fig. 4A, 4B) from anti-hOX40L–treated mice, when compared with control mice. Similar to the splenic Tfh cells (Fig. 4E), CXCR5+ICOS+CD4+ T cells from both livers (Supplemental Fig. 4E) and lungs (Supplemental Fig. 4F) of animals treated with anti-hOX40L–treated mice showed decreased surface PD-1 expression, which is consistent with the decrease in IL-21+CD4+ T cells (Supplemental Fig. 4A, 4B). Taken together, our data (Fig. 4, Supplemental Fig. 4) demonstrate that anti-hOX40L treatment promotes Treg responses while decreasing inflammatory T cell responses, which can suppress the development of x-aGVHD. The frequency of Th2 and Th17 cells were too low to determine the effects of anti-hOX40L treatment. Both TNF and IL-21 contribute to the pathogenesis of aGVHD (1, 40, 41). Our data show that anti-hOX40L treatment decreases both TNF- and IL-21–producing T cell responses. We thus compared anti-hOX40L with combination of etanercept and anti–hIL-21 for their ability to suppress aGVHD manifestations. Fig. 5A shows that anti-hOX40L–treated mice did not show a significant weight loss overtime, whereas IgG2b-treated mice started losing body weight after week 3. Significant body weight loss and progressive disease severity were also observed after week 4, a week after the final treatment, for the mice that received the combination of etanercept and anti–hIL-21 (Fig. 5B), with only half of the mice alive by the end of week 6 (Fig. 5C). In contrast, anti-hOX40L–treated mice had a survival rate of 100% up to week 6 and remained free of aGVHD symptoms (Fig. 5B, 5C). Taken together, these data indicate that IL-21 and TNF contribute to aGVHD, as previously reported (1, 42–44). Nonetheless, anti-hOX40L is more efficient than the combination of etanercept and anti–hIL-21 in alleviating aGVHD symptoms, which could be supported with the enhanced Treg responses by anti-hOX40L treatment. These data also demonstrate that immune modulation with anti-hOX40L results in better and more sustained outcomes than blocking such soluble cytokines. We next tested whether anti-hOX40L treatment could interfere with cytolytic activity of CD8+ T cells. As presented in Fig. 6A, aGVHD mice were immunized with γ-irradiated U937 cells, a human histolytic lymphoma cell line, on day 0, and boosted on days 7 and 14 (29), whereas they were treated with anti-hOX40L three times a week for 2 wk. On day 21, splenic CD8+ T cells were tested for their cytolytic activities using calcein AM–stained U937 cells. As shown in Fig. 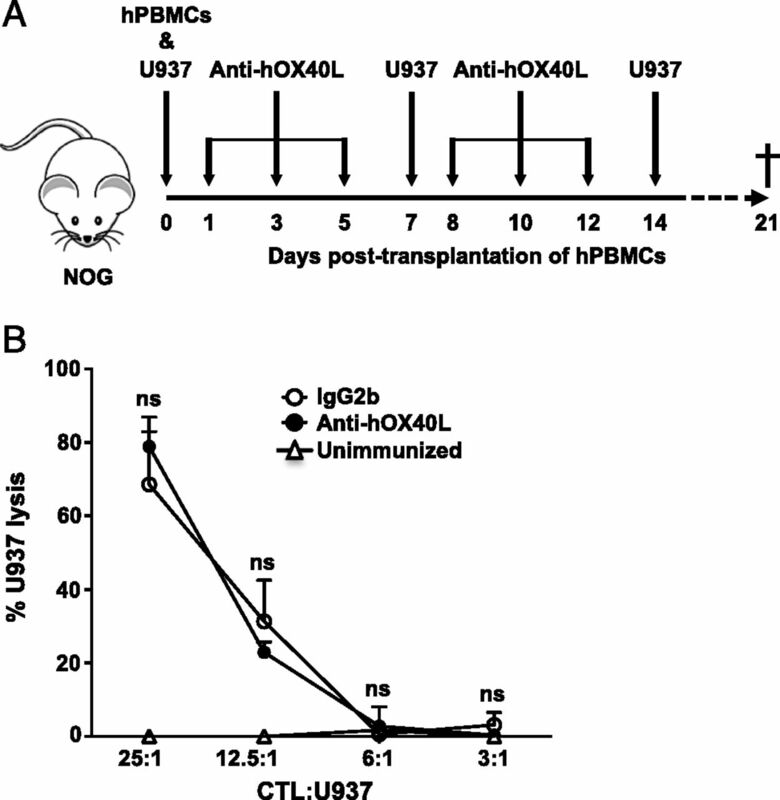 6B, CD8+ T cells from anti-hOX40L–treated mice displayed no compromises in their killing capacity against U937 target cells when compared with mice treated with IgG2b. CD8+ T cells from unimmunized animals did not lyse U937 cells. These data suggest that anti-hOX40L treatment efficiently suppresses x-aGVHD, whereas it does not interfere with cytolytic activity of CD8+ T cells. We next assessed therapeutic efficacy of anti-hOX40L in mice with mild to severe aGVHD. aGVHD mice were injected i.p. with either anti-hOX40L or IgG2b starting from day 21 when mice already exhibited mild to severe aGVHD symptoms. Administration of anti-hOX40L stabilized the average body weight and significantly reduced aGVHD-related lethality compared with the IgG2b-treated group during the course of the study (Fig. 7A, 7B). Anti-hOX40L treatment kept the clinical manifestations of aGVHD in check and even alleviated the symptoms shortly after the treatment started in week 3 (Fig. 7C). These data suggest that anti-hOX40L treatment is able to manage ongoing aGVHD. This study demonstrates that the interaction between OX40L and OX40 is a critical component not only for the induction of aGVHD but also for the progression of aGVHD. Accordingly, blocking the interaction between OX40L and OX40 with anti-hOX40L can effectively prevent and treat x-aGVHD that is caused mainly by human T cells. In addition, this study also extends previous works performed in animals (16, 17) by providing mechanisms whereby hOX40L blockade alleviates aGVHD manifestations without compromising cytolytic activity of CD8+ T cells. Our results highlight the significant effects of OX40L blockade on preventing aGVHD-associated organ damage and lethality. Treatment with anti-hOX40L markedly reduced human CD45+ cell infiltration in aGVHD target tissues such as skin, liver, lung, and intestine. Interestingly, anti-hOX40L treatment did not significantly alter the frequency of CD4+ T cells infiltration in the target organs tested. However, anti-hOX40L treatment resulted in significant decreases of CD8+ T cell infiltration in the target organs especially livers and lungs. These data may indicate the roles of CD8+ T cells in the pathogenesis of aGVHD (30, 40, 45, 46). In addition to the reduced infiltration of T cells in target organs, anti-hOX40L treatment resulted in decreases of IL-21–, TNF-, and IFN-γ–producing CD4+ and CD8+ T cell responses overall, although the levels of significance are variable in different tissues. The decrease of Tfh responses by anti-hOX40L treatment was also supported by the finding that PD-1 expression levels (47–50) on Tfh cells (CD4+CXCR5+ICOS+) in target organs and spleen are significantly decreased by anti-hOX40L treatment. More importantly, anti-hOX40L treatment resulted in increases of IL-10–producing CD4+ T cell responses, which is in line with the increased frequency of Tregs (CD4+CD25+FoxP3+CD127lowCTLA-4+CCR4+) in spleen and other tissues. In addition to the decreased proinflammatory T cell responses, such increases of Tregs expressing IL-10 in the target organs might also play critical roles in the preclinical outcomes of anti-hOX40L treatments (22, 24, 51–53). Sustained role of Tregs in the suppression of aGVHD can be further supported by the fact that animals received anti-hOX40L treatment for 3 wk did not develop aGVHD until the end of experiment (week 8). Although the duration of treatment was specifically designed because human APCs were detectable up to 3 wk posttransplantation and waned overtime, to gain a long-term tolerance, prolonged treatment with anti-hOX40L may take into account in clinical practice in BMT due to immune reconstitution. In one of our ongoing studies, we have further found that anti-hOX40L treatment can indeed promote alloantigen-specific Treg responses in vitro (data not shown). Importantly, the increased frequency of functional Tregs in mice treated with anti-hOX40L did not interfere with cytolytic activity of CD8+ T cells, suggesting that graft-versus-leukemia and Ag-specific memory CD8+ T cell responses are still achievable. Another notable finding of our studies was that blocking OX40L increases CCR4+ expression on CD4+ Tregs, indicating the migration capacity of Tregs to nonlymphoid tissues such as skin and lung (51). Interestingly, it has been reported that the pretransplantation use of mogamulizumab, an anti-CCR4 mAb that was recently approved in Japan as a treatment for aggressive adult T cell leukemia/lymphoma, significantly increases the risks of severe and corticosteroid-refractory aGVHD (53). These results may support the importance of CCR4-expressing Tregs in controlling aGVHD. Activated T cells can also express OX40L (54, 55). We also found that OX40L expression by CD3+ T cells was readily detectable in x-aGVHD mice. Therefore, we cannot rule out the effect of anti-hOX40L treatments on the potential roles of OX40L+ T cells in the pathogenesis of aGVHD. Although no differences were observed between T cells from OX40L−/− and wild-type mice in a primary MLR in vitro or in vivo (17), a human in vitro study suggested that anti-hOX40L reduces the proliferation of donor CD4+ T cells stimulated by purified OX40L−/− mature DCs (54). In this study, we noticed that high doses of anti-OX40L treatment resulted in enhanced animal survivals, but this is probably due to the decrease of human cell infiltration. We thus performed experiments with 10 μg per dose, which provided a minimal impact on the frequency of circulating human CD45+ cells in the blood while retaining maximal protection from aGVHD-induced lethality. Even with this low amount of anti-hOX40L (10 μg per dose), when compared with anti–IL-21 (100 μg per dose) and etanercept (200 μg per dose), we still cannot rule out an Ab-dependent cell-mediated cytotoxicity. However, this question may need to be properly addressed when anti-hOX40L is humanized for clinical usages. In conclusion, this study demonstrates that the interaction between OX40L–OX40 is critical importance for both the induction and progression of aGVHD caused by human T cells. 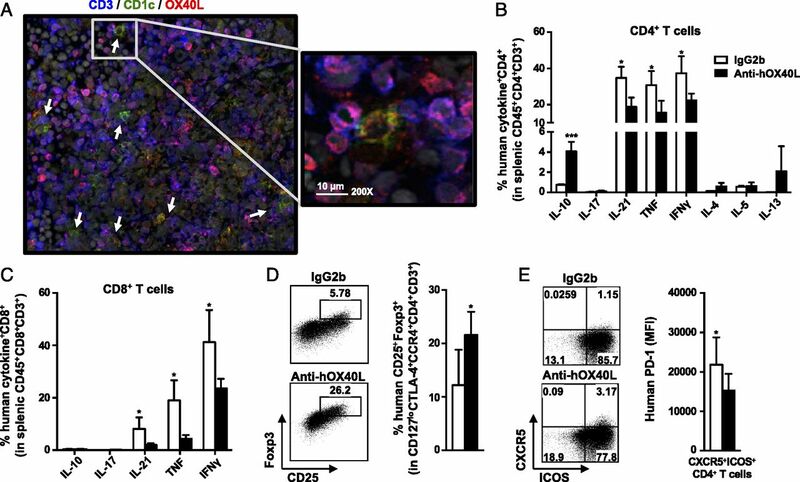 Data from this study further demonstrate that blocking OX40L–OX40 interaction promotes Treg responses followed by an alleviation of aGVHD manifestation without interfering with CD8+ T cell functions. This study also strongly supports clinical development of anti-hOX40L as a novel therapy for aGVHD, especially for patients with residual and relapsing hematological malignancies after allogeneic HSCT. S.Z., H.F., S.H., Y.-J.L., S.O., and H.J. are listed as inventors on patent applications concerning the anti-hOX40L mAb. The other authors have no financial conflicts of interest. We thank the Flow Cytometry Core Laboratory, Sample Procurement Core Laboratory, and Bioscience Center at Baylor Scott & White Research Institute for assisting with work performed in this study. This work was supported by the Mayo Clinic (to H.J. and S.O. ), a Baylor Sammons Cancer Center grant (to H.J. ), and National Institutes of Health Grant R01 AI 105066 (to S.O.).
. 2009. IL-21 blockade reduces graft-versus-host disease mortality by supporting inducible T regulatory cell generation. Blood 114: 5375–5384.
. 2010. Should methotrexate plus calcineurin inhibitors be considered standard of care for prophylaxis of acute graft-versus-host disease? Biol. Blood Marrow Transplant. 16(1, Suppl): S18–S27.
. 2012. Prophylaxis and treatment of GVHD after allogeneic haematopoietic SCT: a survey of centre strategies by the European Group for Blood and Marrow Transplantation. Bone Marrow Transplant. 47: 1459–1464.
. 1993. Cyclosporine, methotrexate, and prednisone compared with cyclosporine and prednisone for prophylaxis of acute graft-versus-host disease. N. Engl. J. Med. 329: 1225–1230. 2009. Immunosuppressive drugs in kidney transplantation: impact on patient survival, and incidence of cardiovascular disease, malignancy and infection. Drugs 69: 2227–2243. 2007. How I treat refractory acute GVHD. Blood 109: 4119–4126.
. 2014. CTLA4-Ig preserves thymus-derived T regulatory cells. Transplantation 98: 1158–1164.
. 2016. Immunosuppressive human anti-CD83 monoclonal antibody depletion of activated dendritic cells in transplantation. Leukemia 30: 692–700.
. 2013. Human T cells depend on functional calcineurin, tumour necrosis factor-α and CD80/CD86 for expansion and activation in mice. Clin. Exp. Immunol. 172: 300–310.
. 2005. In vitro depletion of tissue-derived dendritic cells by CMRF-44 antibody and alemtuzumab: implications for the control of Graft-versus-host disease. Transplantation 79: 722–725.
. 2015. OX40 blockade inhibits house dust mite driven allergic lung inflammation in mice and in vitro allergic responses in humans. Eur. J. Immunol. 45: 1116–1128.
. 2016. OX40L blockade protects against inflammation-driven fibrosis. Proc. Natl. Acad. Sci. USA 113: E3901–E3910.
. 2014. OX40L blockade is therapeutic in arthritis, despite promoting osteoclastogenesis. Proc. Natl. Acad. Sci. USA 111: 2289–2294.
. 2001. Critical involvement of OX40 ligand signals in the T cell priming events during experimental autoimmune encephalomyelitis. J. Immunol. 167: 2991–2999.
. 2001. Amelioration of experimental autoimmune encephalomyelitis with anti-OX40 ligand monoclonal antibody: a critical role for OX40 ligand in migration, but not development, of pathogenic T cells. J. Immunol. 166: 2108–2115.
. 2000. Blockade of CD134 (OX40)-CD134L interaction ameliorates lethal acute graft-versus-host disease in a murine model of allogeneic bone marrow transplantation. Blood 95: 2434–2439.
. 2003. Ligation of OX40 (CD134) regulates graft-versus-host disease (GVHD) and graft rejection in allogeneic bone marrow transplant recipients. Blood 101: 3741–3748.
. 2017. Combined OX40L and mTOR blockade controls effector T cell activation while preserving Treg reconstitution after transplant. Sci. Transl. Med. 9: eaan3085.
. 2010. Efficacy of pretreatment of allografts with methoxypolyethylene glycol-succinimidyl-propionic acid ester in combination with an anti-OX40L monoclonal antibody in relieving graft-versus-host disease in mice. Int. J. Hematol. 92: 609–616.
. 2006. OX40 ligand shuts down IL-10-producing regulatory T cells. Proc. Natl. Acad. Sci. USA 103: 13138–13143.
. 2011. Thymic stromal lymphopoietin fosters human breast tumor growth by promoting type 2 inflammation. J. Exp. Med. 208: 479–490.
. 2005. 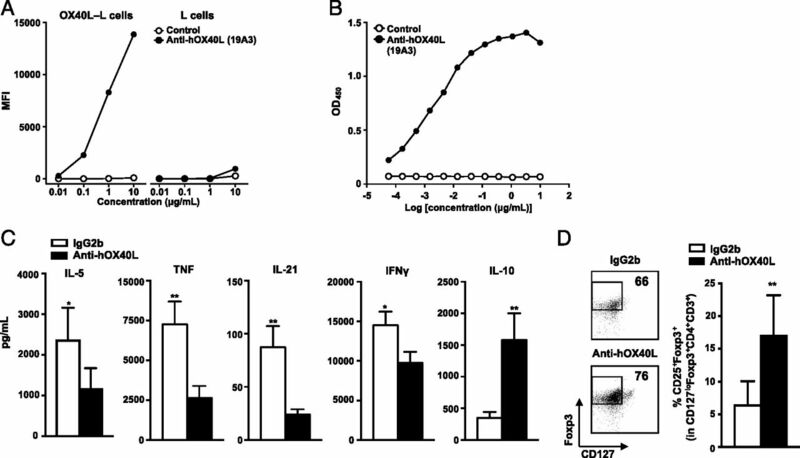 TSLP-activated dendritic cells induce an inflammatory T helper type 2 cell response through OX40 ligand. J. Exp. Med. 202: 1213–1223.
. 2015. Opposing roles of dectin-1 expressed on human plasmacytoid dendritic cells and myeloid dendritic cells in Th2 polarization. J. Immunol. 195: 1723–1731.
. 1996. An experimental model of idiopathic pneumonia syndrome after bone marrow transplantation: I. The roles of minor H antigens and endotoxin. Blood 88: 3230–3239.
. 2002. Human epithelial cells trigger dendritic cell mediated allergic inflammation by producing TSLP. Nat. Immunol. 3: 673–680.
. 2009. Human dendritic cells induce the differentiation of interleukin-21-producing T follicular helper-like cells through interleukin-12. Immunity 31: 158–169.
. 2017. Targeting Aurora kinase A and JAK2 prevents GVHD while maintaining Treg and antitumor CTL function. Sci. Transl. Med. 9: eaai8269.
. 2003. A new xenograft model for graft-versus-host disease by intravenous transfer of human peripheral blood mononuclear cells in RAG2-/- gammac-/- double-mutant mice. Blood 102: 2522–2531.
. 1994. Anti-SCID mouse reactivity shapes the human CD4+ T cell repertoire in hu-PBL-SCID chimeras. J. Exp. Med. 180: 1817–1827.
. 2009. Human peripheral blood leucocyte non-obese diabetic-severe combined immunodeficiency interleukin-2 receptor gamma chain gene mouse model of xenogeneic graft-versus-host-like disease and the role of host major histocompatibility complex. Clin. Exp. Immunol. 157: 104–118.
. 2017. A novel xenogeneic graft-versus-host disease model for investigating the pathological role of human CD4+ or CD8+ T cells using immunodeficient NOG mice. Am. J. Transplant. 17: 1216–1228.
. 2012. Xenogeneic graft-versus-host-disease in NOD-scid IL-2Rγnull mice display a T-effector memory phenotype. PLoS One 7: e44219.
. 2008. A new Hu-PBL model for the study of human islet alloreactivity based on NOD-scid mice bearing a targeted mutation in the IL-2 receptor gamma chain gene. Clin. Immunol. 126: 303–314.
. 2012. Advances in graft-versus-host disease biology and therapy. Nat. Rev. Immunol. 12: 443–458.
. 2006. Activated T cells express the OX40 ligand: requirements for induction and costimulatory function. Immunology 117: 196–204.
. 2013. Anti-CCR4 mAb selectively depletes effector-type FoxP3+CD4+ regulatory T cells, evoking antitumor immune responses in humans. Proc. Natl. Acad. Sci. USA 110: 17945–17950.
. 2012. Blocking IL-21 signaling ameliorates xenogeneic GVHD induced by human lymphocytes. Blood 119: 619–628.
. 2008. Etanercept plus methylprednisolone as initial therapy for acute graft-versus-host disease. Blood 111: 2470–2475.
. 2010. IL-21 is critical for GVHD in a mouse model. Bone Marrow Transplant. 45: 723–729.
. 1999. 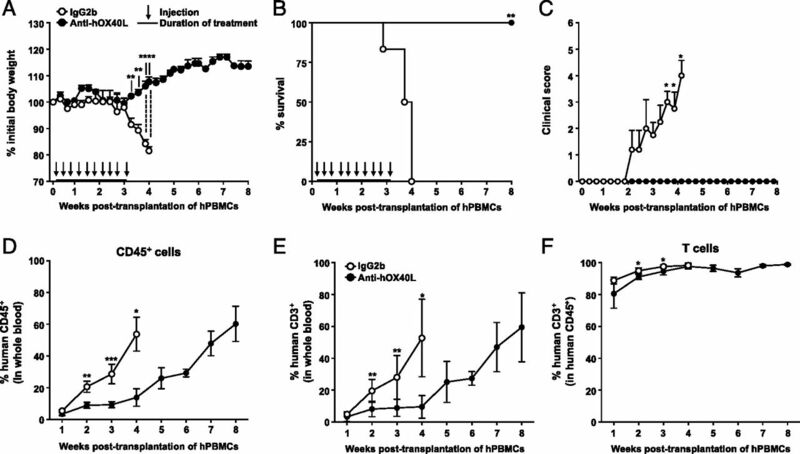 Tumor necrosis factor inhibitor ameliorates murine intestinal graft-versus-host disease. Gastroenterology 116: 593–601.
. 2011. Abrogation of donor T-cell IL-21 signaling leads to tissue-specific modulation of immunity and separation of GVHD from GVL. Blood 118: 446–455.
. 2013. Prevention of acute graft-versus-host disease by humanized anti-CD26 monoclonal antibody. Br. J. Haematol. 162: 263–277.
. 2013. Circulating precursor CCR7(lo)PD-1(hi) CXCR5+ CD4+ T cells indicate Tfh cell activity and promote antibody responses upon antigen reexposure. Immunity 39: 770–781.
. 2018. PD-1 controls follicular T helper cell positioning and function. Immunity 49: 264–274.e4.
. 2014. CXCR5+CD4+ follicular helper T cells accumulate in resting human lymph nodes and have superior B cell helper activity. Int. Immunol. 26: 183–192.
. 2016. Distinct phenotypic subpopulations of circulating CD4+CXCR5+ follicular helper T cells in children with active IgA vasculitis. BMC Immunol. 17: 40.
. 2007. Altering the distribution of Foxp3(+) regulatory T cells results in tissue-specific inflammatory disease. J. Exp. Med. 204: 1335–1347.
. 2011. Functional regulatory T cells produced by inhibiting cyclic nucleotide phosphodiesterase type 3 prevent allograft rejection. Sci. Transl. Med. 3: 83ra40.
. 2016. Pretransplantation anti-CCR4 antibody mogamulizumab against adult T-cell leukemia/lymphoma is associated with significantly increased risks of severe and corticosteroid-refractory graft-versus-host disease, nonrelapse mortality, and overall mortality. J. Clin. Oncol. 34: 3426–3433.
. 2003. Costimulation through OX40 is crucial for induction of an alloreactive human T-cell response. Immunology 109: 226–231.
. 2001. Treatment of severe steroid refractory acute graft-versus-host disease with infliximab, a chimeric human/mouse antiTNFalpha antibody. Bone Marrow Transplant. 28: 47–49.